Copperleaf at The Brooks is a gated active lifestyle community in Bonita Springs, Florida. Pulte Homes started the community in 2000 and completed construction in 2004 with 570 homes set amid lakes and nature preserves. 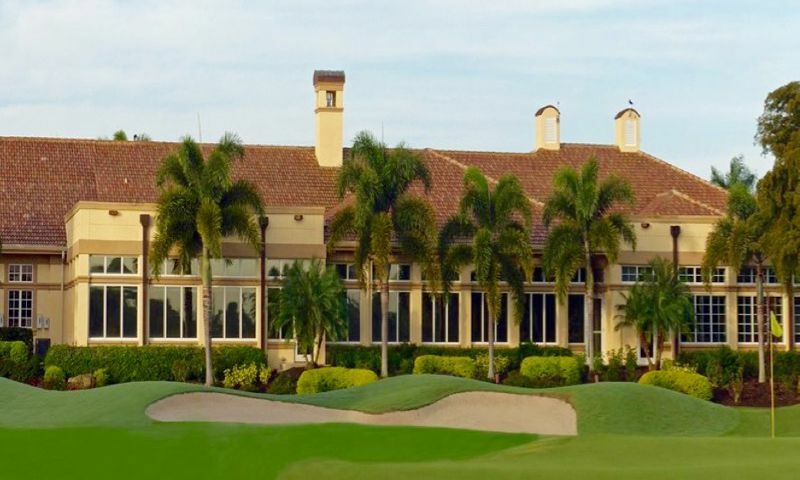 With its own golf course, several options for additional nearby clubs and easy access to all of southwest Florida, Copperleaf at The Brooks is one of the most sought after communities in Bonita Springs. Copperleaf is home to a 17,000 square-foot clubhouse with upscale architecture, gathering areas, fireplaces and more. Formal and casual dining, plus a lounge and catering kitchen, make it easy to grab a meal. Outside, residents can enjoy four lighted tennis courts, two bocce ball courts, a heated swimming pool and spa. Scenic lakes and ponds add more beauty to this resort-style community. Copperleaf's beautiful golf course was designed by Gordon G. Lewis and offers challenging play and options for all levels. Copperleaf Golf Club's practice facility includes an oversize putting and chipping area. But its most intriguing feature is an aqua driving range, which gives golfers green islands to use as targets. The pro shop stocks the finest apparel and equipment for anything you need. Pulte Homes designed Copperleaf at The Brooks as a golf-inclusive community of 570 single-family, villa, and carriage homes in ten separate neighborhoods. Many of the homes offer beautiful views of the Copperleaf Golf Course or scenic water views. Carriage homes are two-story buildings that offer great low-maintenance living. These single-level units each have two bedrooms with a den and an attached one or two-car garage. Detached villas are a great option for those who want a little more space but also want to live the low-maintenance lifestyle. These open floor plans range from 1,600 to almost 2,400 square feet. The single-family homes are the largest homes in the community. These homes are both one and two-story models with first-floor master suites and screened lanais. These low-maintenance homes provide fresh architectural designs that blend beautifully with the natural environment of the community. These resale residences feature neo-Mediterranean-style homes with two or three bedrooms, two or three bathrooms, and attached garages. Some homeowners enjoy a screened lanai or even their own pool. No matter what your interests are, Copperleaf has a club for you. Residents can stay fit in a number of the fitness classes such as yoga and water aerobics. Inside the clubhouse many residents enjoy playing cards with their neighbors or getting together for book club and discussion groups. Copperleaf at The Brooks offers so many clubs and activities that are sure to keep homeowners busy all year long. Just north of Naples and south of Fort Myers, Bonita Springs brings residents the best of beaches, boating, shopping, golf, arts and entertainment. In addition to the obvious Florida pursuits right outside your front door, the nearby Corkscrew Swamp Sanctuary Boardwalk or Koreshan State Park provide a completely different view of Florida. The Bonita Springs Historical Museum can put it all in perspective. The area has two different, extensive shopping centers, with plenty more within several minutes. Bonita Springs even offers a dog beach a feature that's not always easy to find in Florida. Hugged by barrier islands, the town has a secluded feel but is actually close to everything Southwest Florida has to offer. Mound Key Archeological State Park, for example, is a treasure only accessible by boat. From greyhound racing to ghost tours, it's all in Bonita Springs.With easy access to I-75 and U.S. 41, Copperleaf is about 14 miles from Southwest Florida International Airport and Naples Municipal Airport. Copperleaf at The Brooks is a charming active lifestyle community that caters to homebuyers looking to live in sunny Lee County, Florida. There are plenty of activities available in Copperleaf at The Brooks. Here is a sample of some of the clubs, activities and classes offered here. Carriage homes are two-story buildings that offer great low-maintenance living. These single-level units each have two bedrooms with a den and an attached one or two-car garage. Detached villas are a great option for those who want a little more space but also want to live the low-maintenance lifestyle. The open floor plans range from 1,600 to almost 2,400 square feet. The single-family homes are the largest homes in the community. These homes are both one and two-story models with first-floor master suites and screened lanais. My condo at Copperleaf fits my need perfectly. I've got wall-to-wall windows, a nice open floor plan, large kitchen and amazing views. The grounds and landscaping are beautiful, although it seems like some of the areas could use at little basic updating or general maintenance. I use the tennis courts a lot, the pools and the fitness center too. The golf is great and having dining options in the community really has me spoiled, and a few pounds heavier! 55places.com is not affiliated with the developer(s) or homeowners association of Copperleaf at The Brooks. The information you submit is distributed to a 55places.com Partner Agent, who is a licensed real estate agent. The information regarding Copperleaf at The Brooks has not been verified or approved by the developer or homeowners association. Please verify all information prior to purchasing. 55places.com is not responsible for any errors regarding the information displayed on this website.